WOW!!! 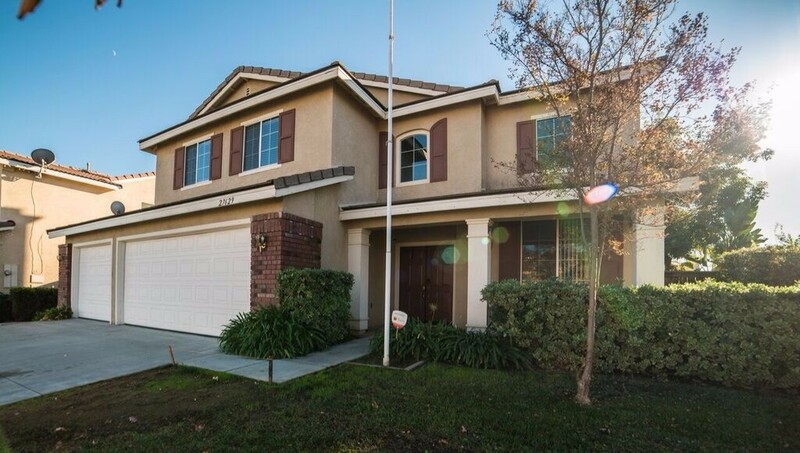 Fantastic cul-de-sac home within walking distance to Vista Murrieta High School. 4 Bedrooms (one on main floor), 3 Bathrooms and large upstairs Bonus room with attached walk-in closet/office (easily turns the Bonus room into a huge 5th bedroom). So many upgrades! Brand new upgraded wood laminate flooring; new paint; upgraded baseboard molding and door casings; stylish dining room lighting fixture; new water heater; smart home technology door knob allows you to create specific entry combinations for the kids and guests. In the backyard, there is a dedicated section for your private garden area. 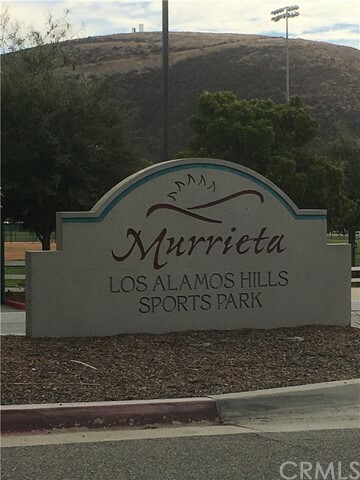 Within walking distance to Los Alamos Hills Sports Park. 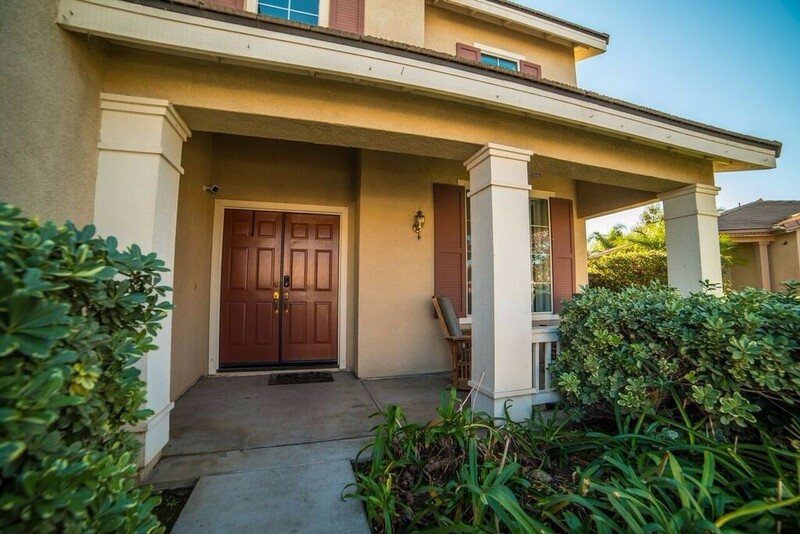 A short commute to both the 15 and 215 Freeways, only minutes away from the Promenade Mall and downtown Temecula. 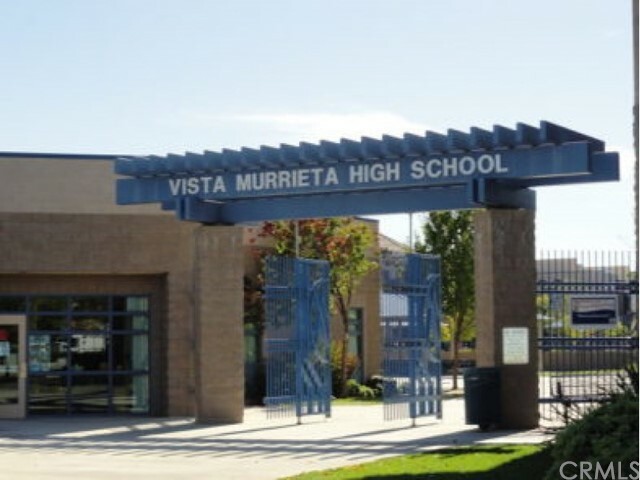 If you are looking for a family home near Vista Murrieta High School, look now further! Welcome Home. This beautifully remodeled, single story Waterfront can be the home of your dreams. This spectacular home in the gated community of Canyon Lake allows you to experience resort style living at its finest. As you walk through the front door, the open floor plan and waterfront views welcome you. The care taken in the remodeling of this home is evident everywhere you look. As you tour the home, you will see that only the best materials were used and completed with excellent craftsmanship. The great room, kitchen and dining areas, with their beautiful tile floors, showcase the beautiful lake views and open to the expansive deck ideal for entertaining. Other finishes include quartz countertops, travertine tile backsplash and stainless-steel appliances in the kitchen. 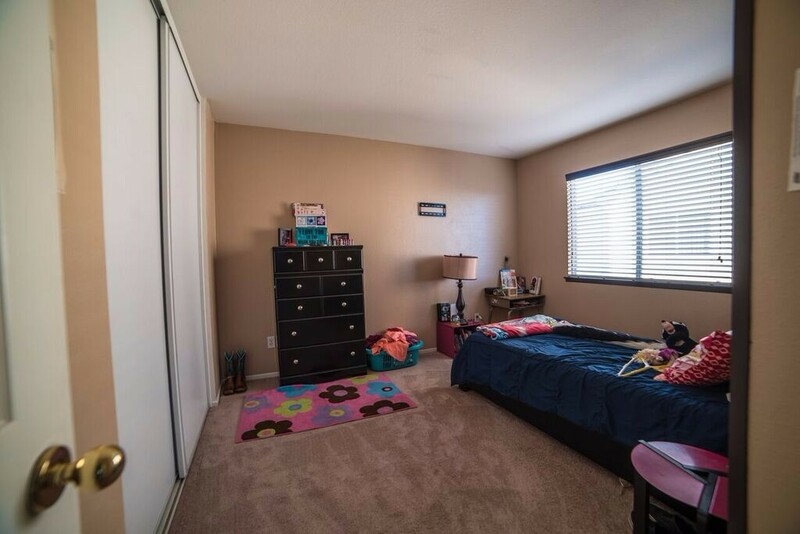 The oversized bedrooms have ceiling fans, frosted glass closet doors and crown molding. The stunning master bathroom has travertine tile floors, tile surround on walls, glass enclosed walk in shower and floating vanity with quartz counter top. The guest bath is equally beautiful with similar finishes and marble counter tops on the floating vanity. The location of this beautiful home is on a “no-wake” section of the east bay that is close to dining at the lodge and water skiing on the main lake, but remains calm for swimming, paddle boarding, kayaking or just hanging out with your family and friends. Canyon Lake is a private community with a 383 acre lake, golf course, parks and lodge with restaurant and bar. Beautiful family neighborhood within walking distance to Lake Mission Viejo. This wonderful remodeled home has 5 bedrooms, 3 bathrooms and a pool with spa (all recently upgraded equipment)! Located on a quiet cul-de-sac, this home is perfect for the family that wants plenty of room and a great neighborhood. 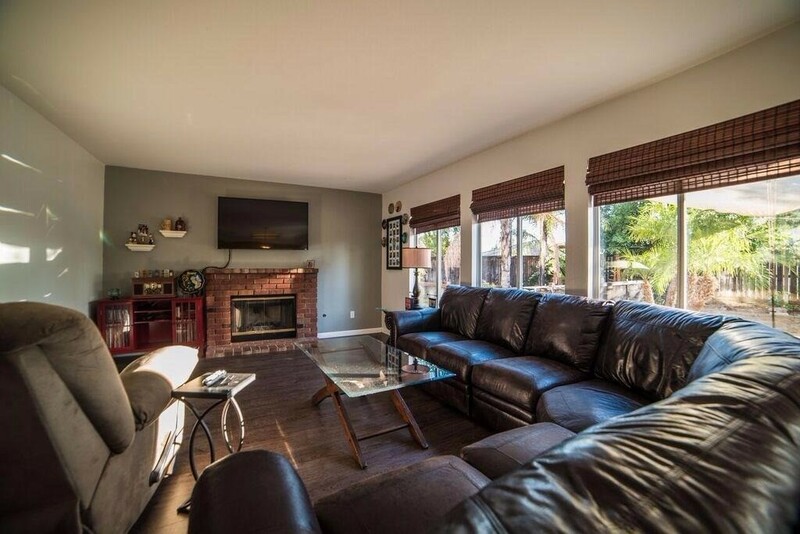 With many upgrades this home is a must if you want to enjoy Mission Viejo living at its finest. A short drive from shopping, dining and entertainment - only minutes away from the 241 Toll Road! Low taxes, low HOA and all of the amenities a Lake Mission Viejo membership has to offer. 5 bedroom homes are rare in this community and it includes an upstairs laundry room! You'll want to see this home before it's sold! Incredible commercial building in the City of Menifee near Canyon Lake with APPROVED septic installed. With C1-CP zoning, there are multiple business uses available. The building comes with the lot directly to the north of the building (APN 341-133-005)...great for overflow parking or future development. Inside there is an excellent receptionist/lobby area. The building also has four separate private offices, all with their own interior and exterior doors (some big enough to possibly divide into smaller work areas). The exterior includes a spacious parking lot, a rock waterfall feature and small courtyards outside each office space. In addition, there is a separate storage room that can be used for file storage or servers. This property has tremendous potential for the right buyer/lessee. More interior photos coming soon. Beautiful Orangecrest pool home located in the most desirable neighborhood in the area. This lovely home has 5 bedrooms (with one on the main floor), 3 bathrooms, an additional downstairs office, upstairs loft and separate upstairs built-in computer desk and gorgeous pool with spa. Truly an entertainer's dream home! It includes a large driveway leading to your 3-car garage with additional parking on the side-yard for a boat or RV. Hardwood flooring in the high traffic areas downstairs including the kitchen with recently cleaned carpet in the bedrooms and family room. The kitchen has double ovens and plenty of room for the chef in the family. The pool has a saltwater system built in for maximum enjoyment. Only one neighbor on one side (the lot to the west of the home is owned by the city and is gated) with block walls for plenty of privacy. If you are looking for home big enough for the whole family and with room to entertain, your search has ended. Honey, stop the car now! Welcome to California Colony, a lovely community within walking distance to world famous Lake Mission Viejo and all of the amenities that come with "Lake Living". This beautifully remodeled Mission Viejo home is a MUST-SEE if you want to enjoy Lake Mission Viejo living at its finest. Welcome to 3 surprisingly spacious bedrooms - one on the main floor, and 2 bathrooms - including a downstairs bathroom that has been ingeniously reconfigured to include a gorgeous walk-in shower and HEATED bathroom flooring. You will love the superbly remodeled kitchen: gorgeous designer cabinets, incredible lighting upgrades, granite counter tops with designer back-splash and premium appliances. Designer flooring showcased throughout including brand new carpet! This home also includes upgraded dual-pane windows, a 50-gallon water heater and insulated garage door. The roof, furnace and A/C units were all recently inspected and serviced. An opportunity to own a home in California Colony with this many upgrades and improvements, this close to Lake Mission Viejo, won't come around again anytime soon. Gorgeous Greer Ranch Pool Home, Stunning! Home offers 5 bedrooms, 3 baths, One full bath and bedroom downstairs, 4 car tandem garage with expoxy finished floors and built ins. Laundry room has plenty of cabinets and wash sink, Covered courtyard entrance, huge entrance door, laminate hard wood flooring throughout downstairs except for kitchen. Formal dining room with built in sideboard for service and kegerator. Home office downstairs with views to the neighborhood, could also be used as a formal sitting area or library. Enter the very large family room centered by gas fireplace and built in media center. Ggourmet kitchen offers a huge dine in area with almost floor to ceiling windows for a very bright area and overlooking the lovely rear yard and pool. Island offers bar seatin, deep farmstyle sink area, all built in appliances are stainless steel including double oven, microwave, dishwasher. Pantry and butler service counter area. New quartz counter tops and tile backsplash areas. The pool is rock style grotto with slide and spa. Pergola type patio cover and turf grass for low maintenance gardening. Upstairs offers another family room loft area. computer work station area with tons of cabinetry and the additional 4 bedrooms. Master suite overlooks pool and offers very large room with master bath dual vanity, oval tub and separate shower, his and hers walk in closets combined. Tastefully done and very elegant, you won't be disapointed to show this lovely home. This property is a tremendous opportunity for the right buyer. The lot is very flat and with usable land in the path of growth. The property location is excellent...close to new housing construction and both Domenigoni Parkway and Winchester Road (Hwy 79). Currently zoned A-2 in the County of Riverside. 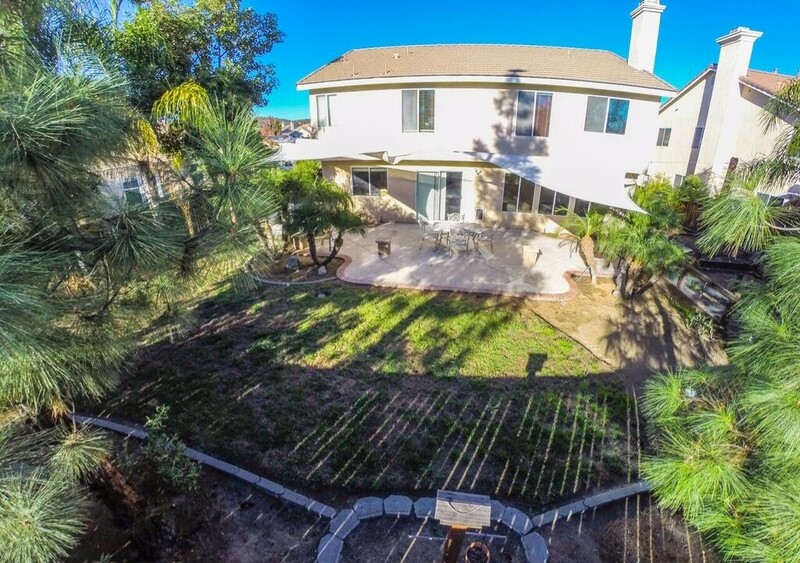 This unique property sits next to the Lake Elsinore City Yard. It is block construction and has been home to the Cabinet Plant. Property sold as is. Welcome home to this turn key beautiful home! All single story living. Home boasts open floor plan to kitchen/family room/ living room! Entertainers delight! Beautiful brick fireplace in the nice cozy family room.Kitchen has been recently remodeled. Bathroom has also been recently remodeled. Walk down the hall to all 4 bedrooms and indoor laundry room with custom built barn door. Two bedrooms share a jack and jill bathroom. 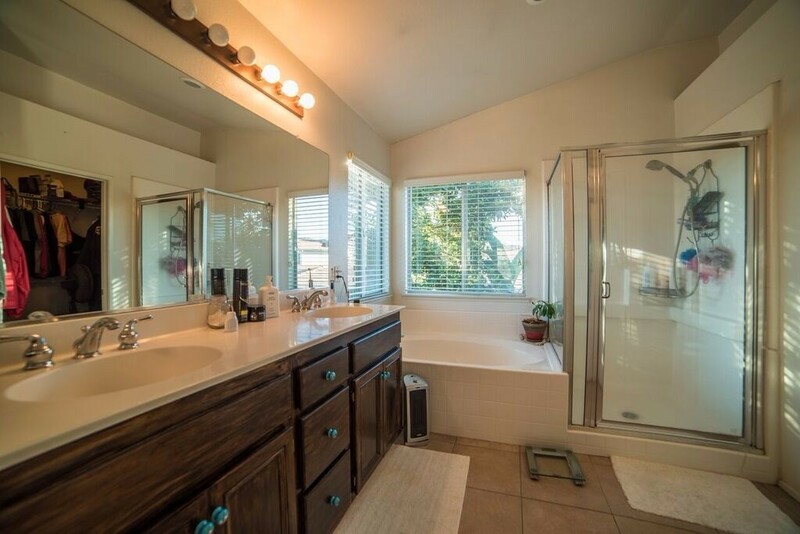 Master has large bathroom with big soaking tub! 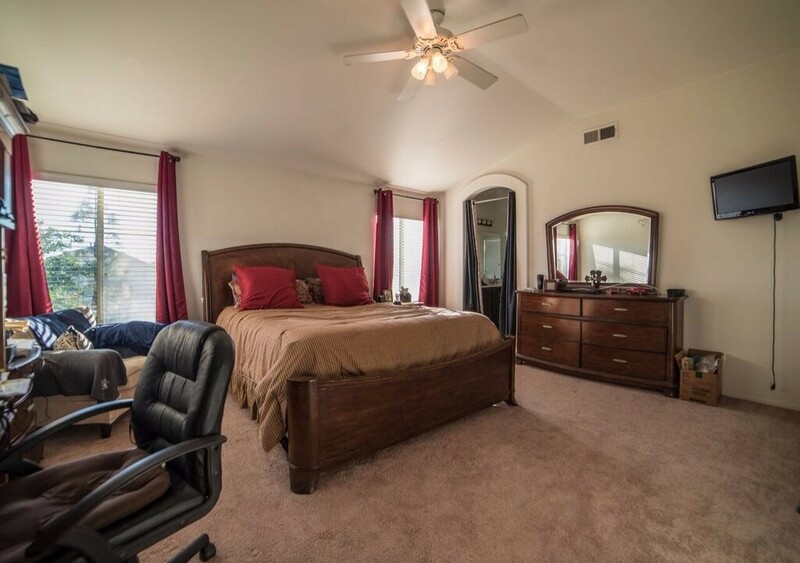 Huge walk in closet in master bedroom, and walk in closets in all 3 other bedrooms. Back yard you will enjoy the large covered patio with Jacuzzi! Fresh sod has just been added! Garage is oversized 3 car garage with workshop/ additional bedroom. Epoxy floors have just been done in garage. All within walking distance to lake and Sierra Park! Must see to appreciate! ***SPRAWLING ESTATE WITH STUNNING POOL AND RV PARKING*** This Majestic Home Features Double Door Entrance and Foyer * 5 Large Bedrooms. Master Bedroom Includes Private Walk Out Balcony Overlooking Beautiful Backyard and Pool-1 Bedroom Located Downstairs * 3 Beautifully Upgraded Bathrooms * Spacious Kitchen Offers Custom Cabinetry, Granite Counters, Wine Bar, Island/ Bar for Seating, Stainless Steel Appliances with Newer Stove Top and Double Ovens * Open Family Room with Brick Fireplace * Formal Living and Dining Room with Vaulted Ceilings Provides Elegance and Comfort for Entertaining * Indoor Laundry Room with Upgraded Counters and Sink * Spacious 3 Car Garage with Side by Side Doors (Not Tandem) * RV PARKING with Gate for Added Privacy * Professionally Landscaped Front and Backyard. Your Backyard Oasis Features Built In Pool Patio with Fireplace and TV Adaption, Hand Laid Stone Pillars. SALTWATER POOL and SPA with Walk In Beach Pad * BRAND NEW SOD in Backyard. Energy Efficient Home with Newer Windows and Dual AC Units. Enjoy the FIREWORKS as this Home is Walking Distance to City Sports Park and Community Center. Close to schools and shopping. 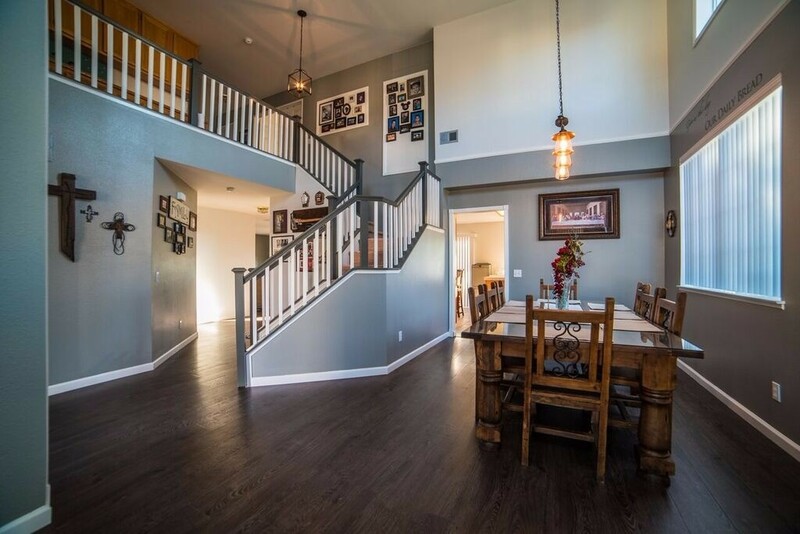 Wonderful South Corona home! 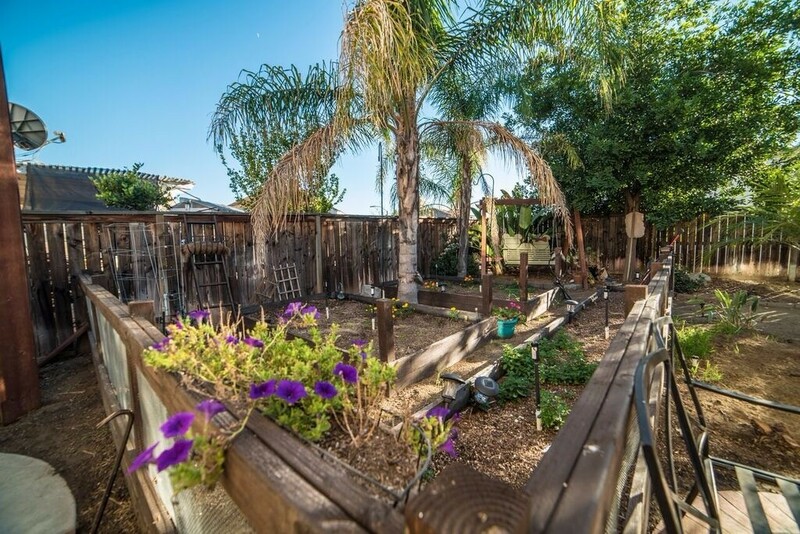 Corner lot with in-ground spa/water feature and drought resistant landscaping in backyard. With 4 bedrooms, 3 bathrooms and a downstairs office that can also be a guest room (or easily converted to a 5th bedroom), this home is ready for you to come in and make it your own. Seller is the original owner and has made multiple upgrades over the years. New A/C installed 2016; new water heater installed 2015. Indoor laundry room, fireplace in the family room that has never been used, large master bedroom with room for a window seat and faulted ceiling. The backyard is perfect for entertaining with an alum-a-wood patio cover, in-ground spa with fiber optic lighting and waterfall. 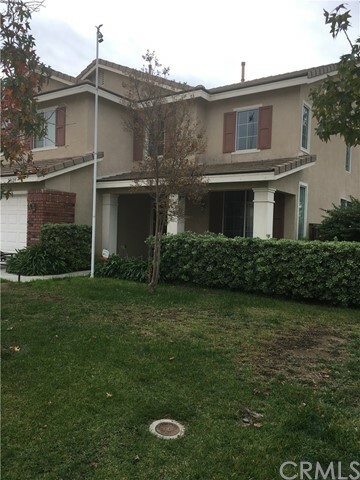 All located in a quiet neighborhood that is just close enough to shopping with multiple access routes to the 91 and 15 freeways. STUNNING SINGLE-STORY POOL HOME THAT IS AN ENTERTAINER'S DELIGHT! This 4 bedroom, 2.25 bath home features a newly painted exterior, low maintenance front yard and gated front porch. Light and bright interior include arch entry, shutters, spacious front office, and a formal dining room. The upgraded kitchen is open to the family room and perfect for large gatherings. Showcasing premium slab granite countertops with full splash, stainless steel appliances, single basin sink, and walk-in pantry. This fabulous kitchen is sure to impress your family and guests. Take your entertaining poolside. This back yard is perfect! Solar heated swimming pool, covered patio, and a spa. Time to unwind? Retreat into your spacious master bedroom. Master bath features a separate soaking tub and shower, along with a beautiful walk-in closet that includes upgraded built-ins. 3 car garage with storage cabinets and work station. NO HOA and LOW TAXES!! UTV/Boat parking on side of the house as well as large custom shed. 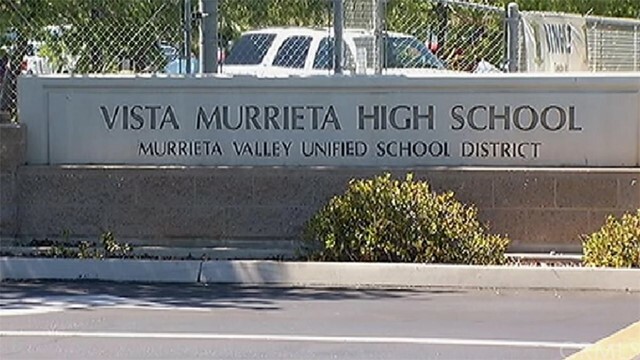 Within walking distance to French Valley Elementary School in the Temecula Valley School District and minutes to Temecula Valley wine country. Don’t let this beauty slip away. **GORGEOUS CUL DE SAC HOME WITH 4 CAR GARAGE STEPS TO LAKE** This Stunning Open Floor Plan Features 5 Over Sized Bedrooms with Bedroom and Bathroom Downstairs * 3 Large Bathrooms * Spacious Kitchen with Island/Bar for Seating, Stainless Steel Appliances, Stove Top and a Abundance of Counter Space and Cabinets * Open Family Room with Fireplace and Media Niche * Formal Living and Dining Room - Perfect for Entertaining or Game Room * Laundry Room with Sink Located Upstairs for Added Convenience * OVERSIZED 4 Car Garage * Large Backyard with Built In Dog Run * DUAL AC UNITS * UPGRADES: Granite Counters, Newer Carpet, Newer Tile Wood Flooring. This Amazing Home is Located in the Highly Sought After Community of Heritage Lake. Home is Only Steps From the Lake, Fishing and Clubhouse Pool in a Quiet Cul de Sac. Don't miss this extremely well priced 4 bedroom, 3 bath home with a 3 car garage that is located on a distinctive street in the beautiful private city of Canyon Lake. Enjoy the recently painted interior and exterior along with new carpet, a newly remodeled kitchen with new appliances and a new tankless water heater. There is a formal living and dining area that could also double as a game room with a bar area. There is one bedroom and one full bathroom located on the main floor and three additional bedrooms upstairs, two of which have a peek-a-boo view of the lake. The large size master has a HUGE walk in closet and a view of the lake. There are several closets perfect for storage. The master bath has dual tile counters, a vanity counter and a jacuzzi style tub. There is plenty of parking in the large 3 car garage with built in cabinets and a drop down storage area. The laundry area is also located here. Enjoy newly landscaped artificial turf , a brand new patio cover with new exterior ceiling fans on a nice pool sized yard. Outstanding "Canyon Crest" beauty! New stainless steel oven just placed into the kitchen! This 3 bedroom / 2 bath mid-century home on a large / pool-sized lot is located in an extremely sought after and quiet neighborhood that is full of charm and no direct rear neighbors. Enjoy walks while soaking in the mature tree lined streets and adorning mid-century architecture. Close to tons of amenities and easy / multiple freeway access. The courtyard welcomes you to an inviting entrance and breezeway / covered patio area and continues a great flow to the rear yard which also includes great views, privacy as well as fruit trees! There's an abundance of upgrades included with this home such as: Fully renovated front and rear yard low maintenance landscaping including drought tolerant plants fed by professionally installed drip system, tile and laminate wood floors as well as dual pane windows throughout. New wood fencing has been added for additional privacy. Ceiling fans are offered along with dimer switches throughout the home! A Quite Cool Stealth Pro 2 speed whole house fan has been added to assist in efficient air control and lower energy cost. South facing roof for solar. Enjoy the upgraded kitchen witch include newer stainless steel appliances and granite counter tops / also included in the bathrooms. Additional upgrades are included in the supplements section. Hurry while this great property in one of the most sought after communities in Riverside is still available!! Beautiful Canyon Lake Home For Sale! This home offers 3 oversized bedrooms 3 bath and was just remodeled! New wood like laminate flooring, new tile flooring and brand new carpet! Fresh paint, new ceiling fans, new baseboards, and super clean! This home is perfect for entertaining with a great open floor plan with a separate dining room with an attached outside deck, a huge living room with a beautiful fireplace, a gourmet kitchen, and an enormous master bedroom! The entire bottom floor of the house is an extra deep oversized 4 car garage with 8 foot garage doors! Perfect for boat parking! The garage also has 1 bathroom and lots of storage! Great cul de sac location! This truly is a must see home! Located to the lodge, pool, parks, and boating! This home is located within the private community of Canyon Lake featuring tons of amenities including boating,fishing,water skiing,wake boarding! It also offers 20+ parks and beaches throughout the community, sports courts like volleyball,pickle ball,tennis,basketball, a community pool,baseball diamonds,a private campground,and a 10 acre equestrian center! Come see why they call Canyon Lake A Bit of Paradise! This 5 bedroom 2.75 bath with 3 car garage has an amazing view. As you enter thru the front door you will find the formal living room, formal dining and family room all open and bright. The downstairs bedroom has a Jack and Jill bathroom with shower. The kitchen is big with plenty of room for a portable island and kitchen table. At the top of the stairs you will find the laundry chute to the downstairs laundry room. The large master bedroom has a deck with views of Big Bear on a clear day. The master bath offers a walk in closet, double sink, enclosed shower and toilet. The additional 3 upstairs bedrooms are good size for the 2078sq feet house. The home schools are excellent Pauba Valley Elm., Vail Ranch Middle School and Great Oak High School. It is also conveniently located to shopping and parks. 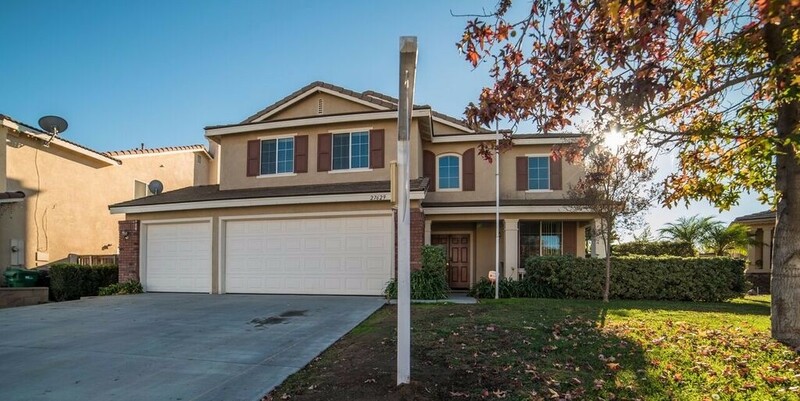 If you are looking for 5 bedroom home in south Temecula, come check it out! Welcome home to this beautiful 5-Bedroom pool home at the end of a cul-de-sac. This wonderful well-cared for home features ceramic tile flooring, neutral plush carpeting, vaulted ceilings, a spacious family room with a fireplace and a separate dining area. The kitchen has newer appliances, granite counter tops, tons of cabinet space and a kitchen nook area. Downstairs you will find the Master Bedroom and Bathroom with a gorgeous tile walk-in shower, walk-in closet and 3 additional bedrooms, 1 bathroom and the indoor laundry room. Upstairs is one very large open bonus area with its own bathroom and closet. 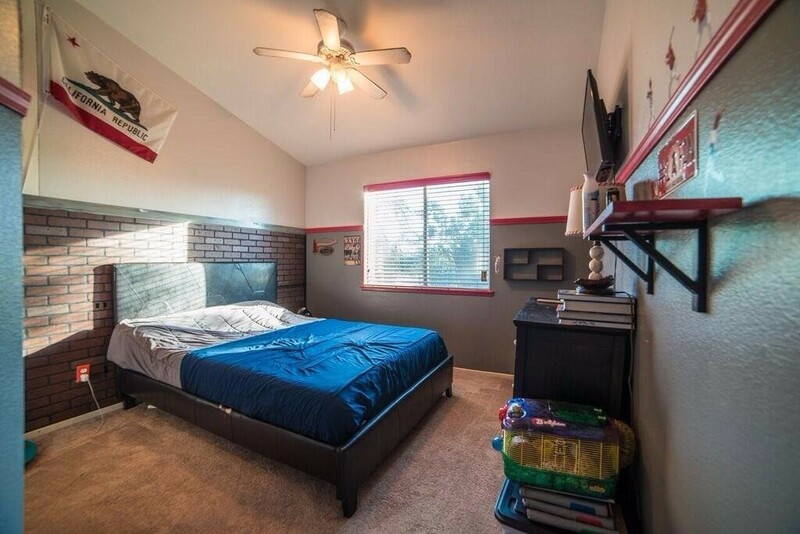 Potential to close off and build another master suite. Step out in the backyard to paradise! Plenty of outdoor entertaining space underneath the covered patio, tons of concrete, fenced pool area, private swimming pool and another great patio for relaxing. This fantastic home also features a whole house fan, solar window screens and an energy efficient OWNED solar system that makes your monthly electric bills minimal. Extremely low 1.1% tax rate, no homeowner’s association and close to schools and shopping! Welcome to Silver Oaks Ranch, one of Wildomar's best kept secrets. This single level beauty offers** PAID FOR SOLAR **NO rear neighbors, open views of the mountains and a single level home on both the right and left sides creating a very private lot. Very spacious and open floor plan w/custom 18'' tile throughout, two tone paint, vaulted ceilings and tons of natural light. 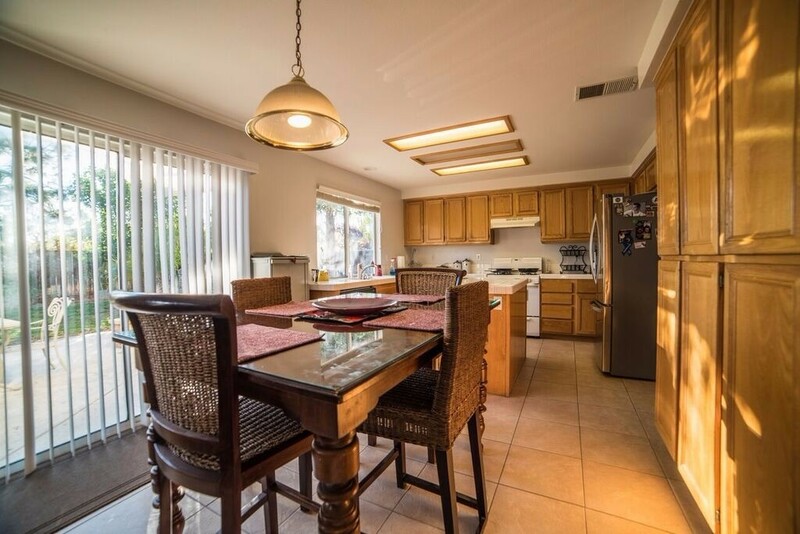 The kitchen has been beautifully remodeled with grey distressed cabinets, custom hardware, quartz counters, stainless appliances, large center island w/bar seating and is open to the oversize family room. The front bedroom is VERY LARGE and has a private bath (second master option) all bedrooms have ceiling fans, plantation shutters throughout, The 3rd bay garage has been converted to a hair studio but can be used as office or play room. Great energy efficacy with new attic insulation and NEST thermostat. 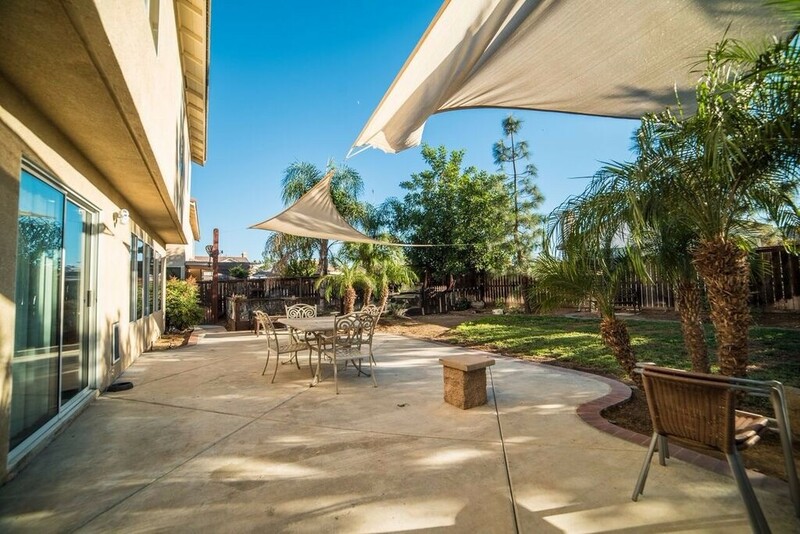 Enjoy entertaining in the spacious backyard with alumna wood patio cover, mature palm trees, river rock, quick curbing and twinkle lights for year round fun, or enjoy the sunset on the courtyard patio. Community offers a cute tot lot with playground. LOW LOW property taxes, this is a rare hard to find single story! 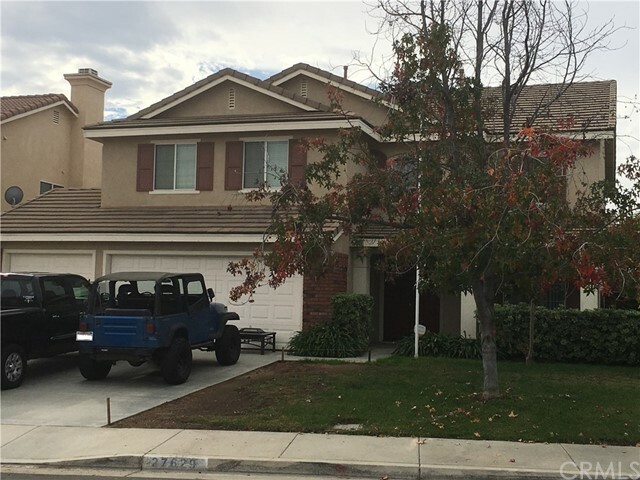 Welcome Home to this beautiful Wildomar 4 bedroom/4 bath/2 car garage home with lots of living space and the added bonus of no HOA and low property taxes! A formal living room accented by vaulted ceilings and a cozy fireplace greet you as you enter the home. The kitchen opens up to a dining area large enough to seat your family and friends! Set off of the kitchen is your private office/library! The family room offers an open concept with the kitchen/dining rooms and leads to the spacious backyard perfect for entertaining family and friends. Downstairs also offers a full bath and laundry room which opens to the garage. The master suite and two bedrooms plus another full bath complete the upstairs. The added bonus to this home is the unique in law/guest suite with a separate outside entry as well as an entry from the downstairs family room! The in law/guest suite features a living area, bedroom and bath with lots of closet space! (Square footage does not include the bedroom addition to the in-law/guest suite). Outside storage is also included in addition to RV parking! This home has it all and is freeway close to the rapidly growing amenities of Wildomar and surrounding communities! Rare Single Story home in the Rosetta Canyon, As you walk in this home, it greets you with shinning laminated wood flooring to an open floor plan, Voluminous kitchen installed with sparkling Granite countertops, Self-cleaning stove, Microwave. Throughout the estate, it has a built-in water softener system. Beautiful tile Fireplace with automatic lighting when turned on. As we know homeowners are becoming more aware of the fire hazard and safety precaution, so they become more concerned about how safe their house is? Don't worry! This home comes with its very own fire sprinkler system to protect you and your family at all times even when you are not home. This home is genuinely diversified by having three comforting bedrooms; The Massive Master bedroom is of pure class attached with double sink, bathtub, and shower. Two of the front bedrooms have the famous Hollywood Jack and Jill format with double sinks As well of sharing enough space for family entertainment & Gatherings. Make room for your toys or workshop equipment this property comes with a mass capacity of a tandem three car garage! Promptly as you walk out the backyard, It greets you with Alumuawood patio cover; The backyard is a garden paradise Fully Landscaped enchanted forest automatic malibu lights front and rear. Automatic sprinklers attached drip lines front and back. Master Laundry room w/Built-in Cabinets. 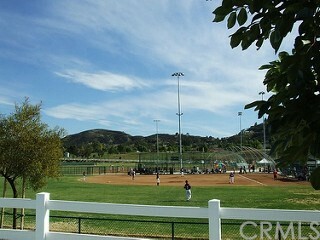 Rosetta canyon has a Sports Park, a 21.6-acre park 5 Tournament caliber ball fields with synthetic turf. BACK ON MARKET! 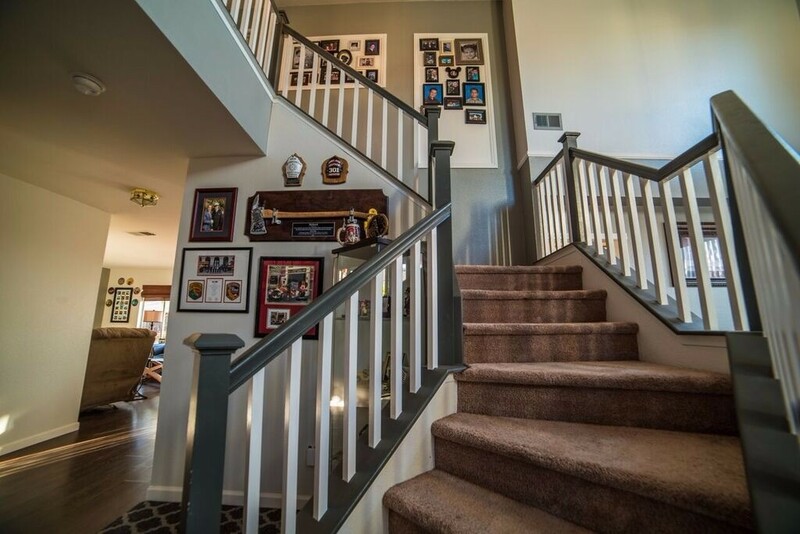 Beautiful cul-de-sac home within walking distance to Valley View High School. Welcome to this beautiful home at the end of the cul-de-sac in a great community on Mountain Springs in the "Family" section of Menifee. With 4 spacious Bedrooms, 2 full Bathrooms upstairs and a guest Bathroom on main floor, you will have plenty of room for everyone. There is even a Bonus Room on the main floor which can easily become a 5th Bedroom. The Master Bedroom includes a double-sided gas fireplace and a separate sitting area with plenty of room for exercise equipment, a home office or the perfect spot to cozy up to a good book and your favorite beverage. Your new kitchen has room for entertaining and new stainless steel appliances. This home also comes with an upstairs laundry...no more carrying laundry up and down the stairs! The front yard has new sod and amazing curb appeal. The backyard is the perfect size for a pool and still has room for a spacious dog run for your furry friends. If you are looking for a great home in just the right neighborhood, with no HOA and low taxes, you found it! Professional photos to be uploaded very soon! Back on the market! Low Taxes and No HOA. Gorgeous single story home on large lot with SOLAR! This home features a beautifully updated kitchen with new energy efficient Samsung appliances, concrete counter tops, subway tile backsplash, tons of cabinet space, separate laundry room, large living area with formal dining space, and has been meticulously maintained. Step outside and enjoy your low maintenance backyard with gorgeous brick patio, large deck with entrance from the kitchen and master bedroom, and new landscaping. Located close to schools, shopping, and the Lake. This is a beautiful home and won't last long on the market. Solar to be paid off at end of escrow. Washer and dryer negotiable. PRICE DEDUCTION MUST SEE TO APPRECIATE - GORGEOUS TURNKEY RANCH STYLE HOME 3 BEDRROM 2 BATH SINGLE STORY HOME. LOT SIZE IS 13,503 SQ. FT. WITH PLENTY OF SPACE TO STORE YOUR TOYS AND ALSO THERE IS PLENTY ROOM TO ADD A 2ND HOME FOR MOTHER-IN-LAW QUARTERS PLUS STILL HAVE ROOM FOR A POOL. THIS PROPERTY LIVING SQ. FT IS 1,711 SQ. PROPERTY IS EQUIPPED WITH AN RV WASHOUT. LIVING ROOM WITH NEWLY REDONE FIREPLACE IN ITALIAN LIMESTONE WITH A NEW MANTEL, BUILT-IN FLAT SCREEN T.V. WITH SPEAKERS THAT STAYS WITH THE HOME. FAMILY ROOM/OFFICE OR DEN. UPGRADED KITCHEN INCLUDING GRANITE COUNTER TOPS, ALL STAINLESS STEEL APPLIANCES. INDOOR LAUNDRY, TRAVERTINE AND WOOD LAMINATE FLOORING. SURROUND SOUND. NEW A/C, NEW FENCE. BEAUTIFUL LARGE BACKYARD. HOME LOCATED NEAR LAKE PERRIS FOR LOCAL CAMPING/FISHING ALONG WITH WATER SPORTS, ALONG WITH MANY LOCAL HIKING TRAILS. Beautiful Home in West Hemet. This home is in one of the most highly desired neighborhoods as well as being one of the largest open floor plans. Overlooking the beautiful lush green park on a large lot, it won't last long! 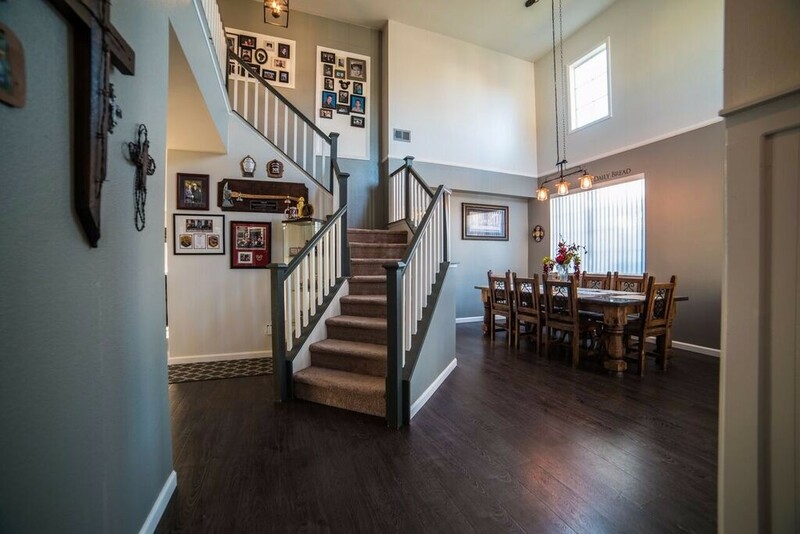 Upgraded 5-Bedroom, 3-Bathroom, 3,337 SqFt two-story home and an additional loft upstairs. One bedroom and one full bathroom downstairs. The spacious kitchen features a butler’s pantry, walk-in pantry, Corian counter tops, glass tile backsplash, built-in desk, kitchen nook area between the family room with a raised hearth fireplace and an individual indoor laundry room off of the kitchen area. Neutral ceramic tile flooring and carpet throughout the large house. Very large master bedroom and master bathroom with dual sinks, separate stall shower and soaking bath tub and very large walk-in closet. Three car tandem garage with automatic opener. HUGE backyard with a very large Alumawood patio with ceiling fans. Wonderfully located with easy access in and out of town near Domenigoni Parkway and the 215 Freeway. Close to schools, shopping and dining. NO HOA!!! Welcome to The Oasis, Menifee's premier senior community. Close to new shopping and dinning, The Oasis is the place to be. This charming home features laminate wood floors throughout the entire home, offering a separate formal sitting room and family room. The family room is open to the kitchen with a cozy fire place w/granite surround and media niche. The architectural details of the arch ways throughout the home add plenty of character. The kitchen offers ample cabinet space, granite counters, center island w/seating and a spacious pantry. Both bedrooms are generous in size, and are laid out on opposite ends of the hallway giving your guests or roommate privacy. This floor plan also offers a den/office space in addition to the 2 bedrooms. The master offers a private bath w/walk-in closet, dual sinks and separate tub and shower. 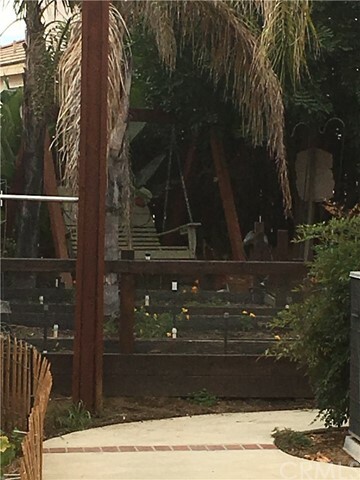 What a wonderful backyard space to relax and enjoy the SoCal weather w/alumna wood patio cover w/fans, drought tolerant landscaping and mature tress for added privacy. The Oasis offers a 22,500 sqft club house with pool, spa, tennis courts, outdoor BBQ and cooking facilities, workout center, library, craft room, ping pong/dart emporium, as well as a billiards room, they have thought of it all! BACK ON THE MARKET! Charming single story Temecula property in the gated community of Country Glen! This lovely 2 bedroom/2 bath is a must see! New wood laminate flooring throughout, granite kitchen counters, new custom paint inside. The exterior has just been freshly painted too! This Home has no shared walls! Close to shopping, restaurants, and Temecula Wine Country! Right across the street from Temecula Hospital. Come check it out because it won't last long! HUGE PRICE REDUCTION!!! Beautiful family home in a wonderful, gated community. The home has 4 bedrooms, 2-1/2 bathrooms, an upstairs laundry room and 2047 square feet of living space. The garage has been upgraded into an incredible customized space with built-in cabinets, upgraded floor and custom paint (more photos coming soon). The open floor plan provides an excellent flow throughout the downstairs living area. Upgraded appliances in the kitchen and dual-pain windows throughout. The gated community provides a barbecue area and two separate "tot lot" playgrounds. HOA also pays for the front yard landscaping and maintenance. Close to shopping, within walking distance to two schools and a park, and for commuters, close to the 60 freeway. If you have been looking for the right home for your family, this home is a must see! Great home on a small cul-de-sac in desirable Southeast Hemet. 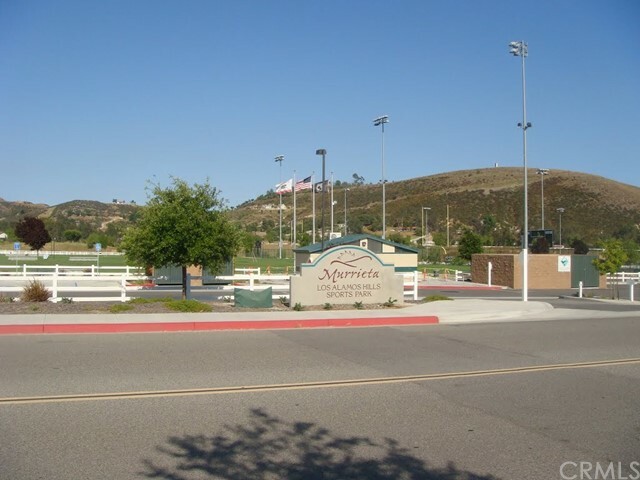 Located within walking distance to Little Lake Elementary School, Dartmouth Middle School and Hemet High School. The very spacious floor plan offers faux wood tile, neutral carpet, indoor laundry room, a family room with a raised hearth fireplace, vaulted ceilings, formal living room and formal dining room. The kitchen has been upgraded with granite counter tops, newer appliances, a high breakfast counter bar with granite and stacked stone and offers plenty of cupboard space and . The master has a large walk-in closet, master bathroom has double sinks and and both a privacy glass enclosed shower as well as an oversized oval garden soaking tub. Step out into the backyard into your serene private oasis with a large custom-built Koi pond and babbling waterfall and a wonderful gazebo. Convenient three car garage with ample built-in storage including a huge workbench area, gated RV access and a large fully drywalled shed/workshop with electricity and RV amp hookup. Gorgeous views of the San Jacinto mountains! Extremely low 1.1% tax rate and no homeowner's association!! This turn-key home will not last long! 55+ community. This home is RARE. An original Del Webb #500 on the 15th tee box of Cherry Hills golf course. Views of Menifee City lights. Sit on your patio and enjoy. An opportunity that does not come along very often. The owner is the original buyer in 1966. Amazing!! Newer air and heat, roof is in great shape. This home is waiting for your personal touches to make it your own. The chance of a lifetime to own a golf course view home in SoCal on the best street in Sun City Menifee. Don't hesitate to bring us an offer!!! This is a beautiful 3 bedroom, 3 bathroom, home with a spacious 3 car garage located in a desirable area in the city of San Jacinto. This home features an open kitchen looking into the living room with an additional family room downstairs indoor laundry hookup and high ceilings. The backyard features a flat yard with enough room for the kids to play, and potential to create your dream garden. 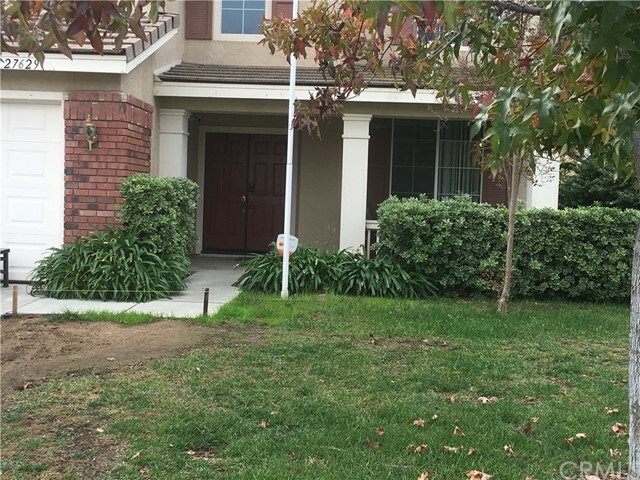 It sits in a cul de sac near schools, shopping, freeways, parks and trails. Come and see your next new home today! Welcome home to this beautiful single-story, cul-de-sac home. Welcome home to a lovely cul-de-sac, single story home. Built in 2005, this wonderful home has fresh interior paint, beautiful tile throughout the common areas and new carpet in all 4 bedrooms. The two bathrooms both feature upgraded cultured marble counter-tops and sinks. Upgraded ceiling fans with dimmer lights throughout the home and floating shelves in the living room. And wait until you see this kitchen: under cabinet custom lighting, gorgeous espresso cabinets and quartz counter-tops. And when it comes to security, there is even a built in safe for your valuables. This home will not last. BACK ON THE MARKET! This single story home is located in the highly desired, 55+ master planned community of Sun City in Menifee. The home's beautiful exterior welcomes you with a large front porch and double entry doors. Features include a spacious and open floor plan, fireplace, indoor laundry, and two large bedrooms. The master bedroom features a large en-suite bathroom and has plenty of closet space. Enjoy relaxing in your low-maintenance, fenced backyard with several mature fruit trees and a covered patio. The two car tandem garage allows for ample parking for your cars, golf cart or for additional storage. This home also features solar! Best of all, with an acceptable offer the sellers are willing to credit buyers for up to 5 years of solar lease payments (ask for details). Enjoy all the amenities that the Sun City Civic Association has to offer. HOA amenities include pools, spa, lawn bowling, golf, and various social activities throughout the year. Have an RV? The association has a place for that too! You know the saying...Location, location, location! 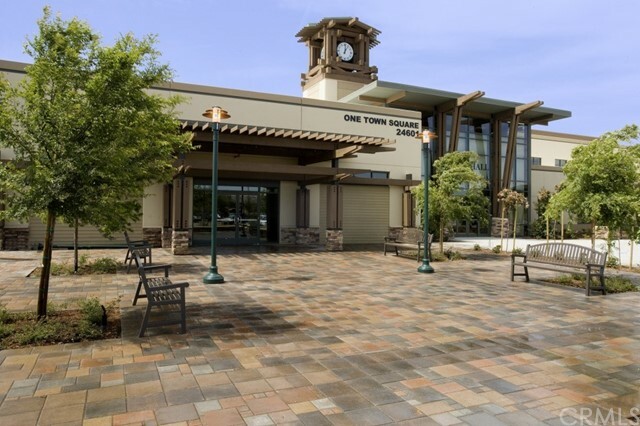 This community is close to shopping, restaurants, banking, medical facilities, and freeway access. Come make this house your home! Over $190,000 invested, take over and save time and money! Plans and engineering complete and paid for. Permits in hand and ready to build. City fee's paid, HOA fee's paid, School fee's paid, permit fee's paid, water and sewer fee's paid, water meter in, rear retaining wall in. Grading per original plan is complete, plans resubmitted to enlarge garage and have a flat driveway. Plans are for 3100 sq ft house on top of 3100 sq ft garage. In process of getting new grading and retaining installed. Price will change accordingly. Currently has water view while open lot across the street remains open. Across the street from water and close to Road Runner Park and Indian Beach. Short golf cart ride to golf course, lake, pool and club house! Builder in place ready to build! Honey, stop the car! Welcome home! This beautiful single story POOL home is move in ready. It is in a very desirable area...a short drive to shopping, schools and both the 215 and 10 freeways. With granite counter tops and stainless steel appliances, you will love entertaining here. Upgraded flooring throughout and granite counter tops in both bathrooms. You must see to fully appreciate! Come see it before it's gone! Great opportunity to own a charming single story home on permanent foundation situated on a large lot in Winchester! Close to Winchester Rd and Domenigoni, 33213 Willard Street is fully fenced featuring a large useable lot for gardening, storage, and parking. Come into the home through the bright and open kitchen with a bonus dining area. The spacious living room awaits you as you walk through the kitchen, featuring tall ceilings, cozy fireplace, and a connecting formal dining room. The master bedroom has its own ensuite bathroom with a deep soaking tub, separate walk in shower, and double sink vanity. All the bedrooms are well laid out and graciously sized! The backyard is full of possibilities and abundant with fruit trees. Capture the breath taking sunsets and sunrises in your very own home- no fuss, just easy living. Rare, well maintained home priced to sell! Take a look at the open floor plan and immaculate back yard on the golf course. Updated double-pane windows, ac, heat and roof! Laundry room inside. Large eat-in kitchen, huge master bath, and expansive covered patio to watch the golfers. 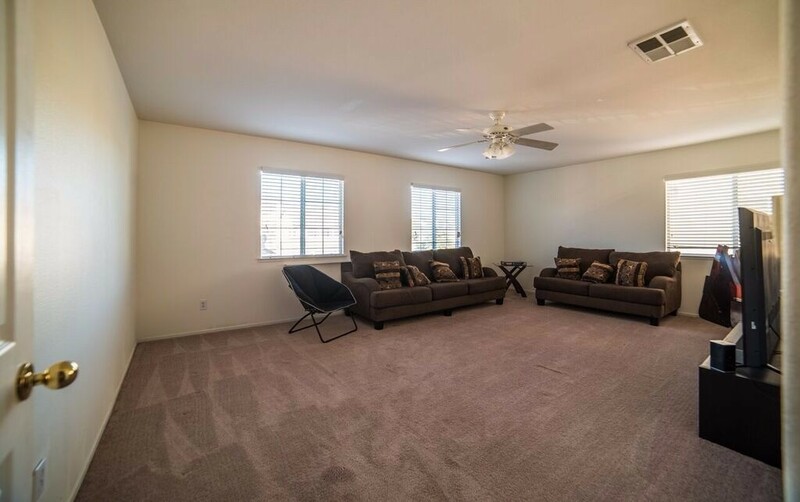 In the heart of Sun City with easy access to freeway and activity center. Sun City has tons of activities for your active lifestyle. Must see. Helping you reach the Top of Your Hill! Opportunity Knocks, Elevated Flat Huge Lot located on the corner of Gray Fox and Bluebird. 27,000 sq ft to build your dream home estate surrounded by waterfronts and parks. Easy to walk this lot off of Bluebird next to nearest neighbor yard. Check out the stunning views and gorgeous sunsets awaiting you. 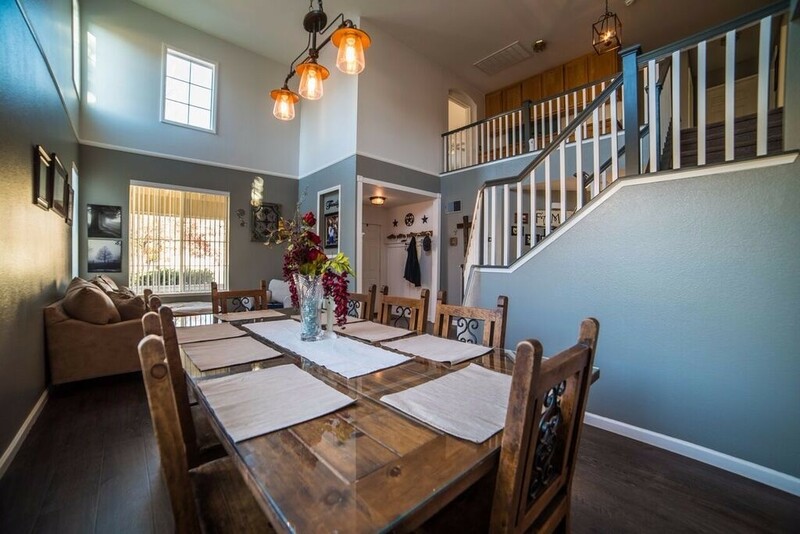 Welcome Home to the Tranquil 55+ Active Adult Community of Sun City in Menifee. This Beautifully Upgraded Home is an End Unit, Single Level Floor Plan with no stairs. Enjoy the Serene setting on your Private Enclosed Patio overlooking the Lush Landscaping. The home has been Tastefully Upgraded with New Wide Plank Flooring, Granite Counters, New Vanities and Fixtures in Both Baths and has also been given a Fresh Look with New Carpet and Paint throughout. Enjoy all that Sun City has to offer including Association Pool and Spa, Picnic Areas, Lawn Bowling and much more. Don’t miss out ~ Your New Home Awaits! Perfect little starter home or investor special. 2 bedrooms 1 1/2 bathrooms, indoor laundry, pool, detached 2 car garage. The main 2 car garage has been coverted to a large living room for extra living space. Unsure of any permits or square footage. Buyer to do own investigations. Property sold in its AS IS present condition. Seller to do no repairs. BUILDING IS BACK IN CANYON LAKE...PARADISE! This Lot has a great view of the north Ski area and a block away from the north gate and 10 min. from the 15 or 215 fwys. Motorcycle owners, you can be off and riding a block from this lot. It is located just around the corner from the equestrian center and the baseball fields. There is hiking and 10 miles of mountain bke trails, again...right out the north gate. Canyon Lake is a 24/7 guard gated community with amenities such as a golf, tennis, kayaking, paddle boarding, fishing, basketball, beaches, parks. The is a beautiful Lodge complete with an olympic size pool and views everywhere. Community is what you feel here...Too many family events each year to mention! Truly a place to find an active lifestyle that is also friendly and tranquil. Come tour our bit of paradise! Well-priced 5 acre parcel close to Temecula. Owner financing available.